DC Home and Condo Prices: Metropole: Overpriced? The Metropole, facing both pedestrian-thriving P Street and the converted warehouses of Church St., adds 90 new condos starting from $485k to $2.1m (underground parking included with all units) by Metropolis Development (MDC), which also built Cooper-Lewis, Lofts 14, & Langston Lofts, all in Logan Circle. Architecture by RTKL and interior design by HGTV-design phenom Cecconi Simone will offer 20-foot high floor to ceiling windows in many units, Bosch appliances standard, two-story interiors on most units, and braggingly large private terraces on all top floor units (all of which also include a loft that overlooks the main living space), and some of the best interior design south of Manhattan. The Metropole replaces the old Duron paint store (no architectural loss) just steps from Whole Foods and Logan Circle, now rivaling Dupont for great retail, 4 blocks from Metro, 8 minutes by foot to the White House. Retail occupies the first floor, including a 23k s.f. Vida Fitness and Bang Salon. 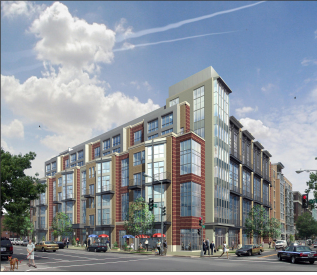 Construction began in August 2006, but received a major setback when Glen Construction, the main contractor on the project, went bankrupt, leaving this and other large residential projects throughout DC to find new GCs, here with Foulger Pratt. Settlements began Nov. 7th, 2008. This will be one of the few condos to feature Ritz-style concierge services, available to purchasers from the time they sign the contract. Given its prominent and visible location, there was a lot of interest in the building. It was featured in a WaPo article in late September 2008 and my friends at UrbanTurf wrote a story on it, too. One fact that struck me when reading UrbanTurf's article was that the prices seemed a little too 2005ish to me. So, armed with Excel, Redfin, and the District's real property sales database, I did a little analysis to see whether my gut instinct was correct. I captured price and unit data [bedrooms, size, whether parking is included] on all sales in the building through year end 2008 as well as those units currently listed on MLS. I pulled comparable sales for the neighborhood - condo sales in squares 0208, 0209, and 0210 - for 2008. To account for those units that are listed as having parking spaces, I determined that the District values parking spaces in the area at $35,000. For those Metropole units I know have parking spaces (all are listed on MLS), I performed two analyses: value with parking space included, value excluding parking space. Since I don't know whether other units sold in the area and building had parking spaces, I assumed not. Results? On an unadjusted price per square foot basis, with two exceptions units at the Metropole range from 7.13% to 58.65% more expensive than comparable units sold in the neighborhood in 2008 [see table below]; the average is 23.11%, the median is 24.89%. Moreover, there's a wide disparity in prices paid for units that have the same floor plan. For example, units 203, 204, and 205 are the same size and have the same floor plan, yet almost $40,000 separates the most expensive unit from the least. I'm sure having Vida and Bang downstairs is nice and the [probably expensive] Ritz-style concierge services is convenient, but I'm unsure it's worth the hefty premium. the low tier units (203,04,05) are poorly designed afterthoughts. They did not bother to redesign the kitchen cabinets/counter to accommodate these smaller sized units. As a result, the kitchen/living/dining area is more of a kitchen. The proportions are so odd that no matter how you set up your furniture, you will feel like you live in a kitchen. Add the fact that these units face the dumpsters in the alley, and they are even less desirable. The kitchens aren't necessarily a liability, if you're the type that can afford to eat out every night. What's the point of all those stainless amenities and marble countertops if all you use them for is to reheat frozen pizza? Greta analysis. Would love to see your thoughts on the Floridian near U. St. Thanks! I'll add the Floridian to the list. I'd be interested in seeing some analysis on Union Row. I've been getting emails every few weeks with price drops, wondering just how far they'll drop before they start selling. Insightful analysis, as usual--thanks for crunching the numbers. The 203/204/205 price discrepancy likely reflects two variables: 1) some buyers opted out of the included parking space (~$35k, as you estimate), and 2) the price of finishes can vary by several thousand dollars. Also, I think that nearly all units include a parking spot in the purchase price. It might be more accurate to factor in a spot if unsure. 1. I love my floor plan and didn't find anything like it in the area. Price per square foot is one of the only quantitative measures we have, but it doesn't capture the design of a space. I've noticed that in my case there are space sacrifices to achieve a design that feels more livable and makes a strong positive impression. Some people will like that, others won't. I'm definitely a fan. 2. The amenities are still being ramped up but I wanted at least a part-time front desk (I'm hoping we can go 24/7 like 22 West), package service, dry cleaning service, a gym in the building or next door, and a great location for frequent purchases like supplies (CVS, Logan Hardware) and food (Whole Foods). 3. Several near-comps are on 14th street, and to me the locations didn't feel nearly as nice as 15th and P. It's personal preference, but to me 15th feels quieter, safer, and less in transition anywhere on 14th. I'd be interested to hear from people who are looking in the area and can compare current prices. it was quite amusing hearing earlier this year that the developer was simply "not going to lower his prices" only to find they've dropped on the MLS about 6% so far. How much further will they go? Has there been any more analysis of the Metropole? I'm glad prices have eased a bit on the smaller units and have heard that the new sales team is doing well, selling an average of almost one unit per week. The location and features will sell the units quickly, as long as the prices for ~700 square feet aren't circa 2005. By the way, as an owner of one of them, it's nice to see a pattern in the 213/216/219 and 413/416/419 units. Those are all the same floorplan (except 413, which is ~125 sqft bigger) and all seem well priced. Again, thanks for the analysis.